If you seek a quotidian experience while traveling, check Airbnb first. It can be a fraction of the price of a hotel room, and there’s a good chance that you’ll end up with some hospitable folks in a happenin’ part of town. Read the reviews, cross-reference the location with your itinerary and start a dialogue with the host to determine if it’s a good fit. You’re likely to see a side of town that you might not see otherwise if you book with one of the locals. If where you crash is as important as where you eat when you travel, then you’ll be at ease at the Listel Hotel. The business boasts its art collection, which also encompasses its farm-to-table restaurant Forage. The restaurant has received warm praise since it opened and is vocal about maintaining its sustainable dining practices at an accessible price. They have Monday through Friday breakfast and dinner menus with brunch on the weekends that, depending on the time of year, might include dishes like a stinging nettle gnocchi with beer-poached radishes, English peas and brown butter. They also have B.C. beers and wines, both bottled and on tap. The global Fairmont hotel chain is host to a unique establishment in the Vancouver restaurant scene: the city’s first sushi joint to achieve a 100 percent Vancouver Aquarium Ocean Wise approval. RawBar is mostly open for lunch (Monday through Saturday, lunch and dinner on Sundays) and favors British Columbia’s most environmentally friendly seafood options including West Coast sea urchin, giant Pacific octopus and geoduck. They also offer sake-steamed mussels seasoned with combinations like ginger and honey or bacon and dashi. Keep an eye out for daily specials. • Benton Brothers Fine Cheese: This is the place that’s believed to have broken the mostly cheddar-serving cheese shop mold in Vancouver. Find your Époisses and Mont d’Or here, alongside a large and interesting Canadian cheese selection. 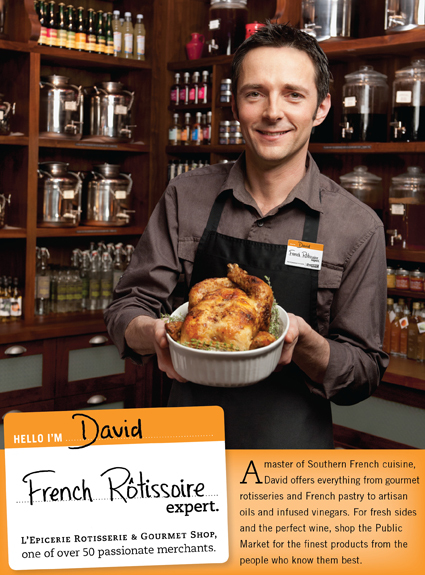 • L’Épicerie Rotisserie & Gourmet Shop: This compact épicerie delivers the best of the French tradition. Find fancy pantry staples like infused oils and vinegars alongside specialty mustards and spices. Their B.C.-sourced meats are one of their obvious fortes. When you go: Order the shaved lamb with caramelized onions, mushrooms, lamb jus and porcini aioli. • Oyama Sausage Co: The New York Times once said that charcutier Jan van der Lieck “may be the most gifted, and certainly the most diversely talented meat man in North America.” The multifarious sausage menu (which changes weekly) speaks for itself: red wine elk, venison with blueberries, pancetta lemongrass pork sausages and bison with arugula and roasted garlic are only a handful of options available this time of year. • South China Seas Trading Co: Vancouver’s immense diversity means that ingredients and foods that might otherwise be exotic rarities are accessible. This market stand encompasses specialty ingredients under at least nine major geographical categories including Mexican/Latin American, Far Eastern and African. Peruse their produce selection, which might include Australian finger limes, Brazilian caja-manga or Thai green eggplants depending on the time of year. • Day Vendors: The market is home to more than just its full-time vendors. Thanks to its day vendor program, some of the finest local artists and food and drink producers rotate through market booths on a weekly basis. These businesses are required to have juried approval before setting up shop and are mostly full-time professionals selling everything from flavored nuts to handmade tableware. One of the advantages of visiting Vancouver is that it’s a destination for both “beach people” and “mountain people.” Peaks that rim the city hug the coastline and allow for roughly 11 miles of beaches within city limits. At the same time, 11 percent of the city belongs to its 220 parks that blur the lines between the urban landscape and West Coast rainforest. The largest is Stanley Park, which encompasses nearly 1,000 acres in Vancouver’s West End. The massive public space also includes over 15 miles of forest trails, multiple art installations, an aquarium, several gardens and other seasonal attractions. Surrounded by the Pacific, the roughly five-mile Seawall path borders the park and is open to both pedestrians and bikers. The near century-old wall follows the city’s coastline and has various entry points spanning from Kitsalano Park near Granville Island to the Convention Center in downtown (see map). A fish shack that’s right on fisherman’s wharf near Granville Island. It’s a takeout fish and chips place with amazing tacos and a great Asian-style coleslaw. 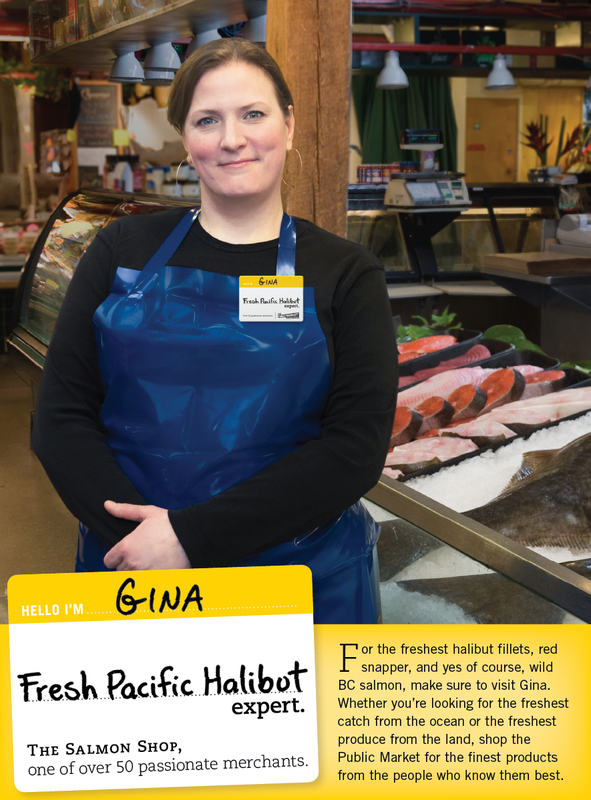 The fish is as fresh as it could possibly be. It ain’t fancy, there’s a small covered outdoor eating area, so most people take it to go and sit on the Seawall. This is one of the most eclectic spots in Vancouver. It is tucked away in a quaint neighborhood far enough from the city center that upon walking through the door, you automatically feel a little more calm and at ease; time actually slows down for me while I’m there. It is part French café, part corner store (sample the British Columbia cheeses) and a beautiful space to convene with friends and connect with the community. A two-minute walk from the Public Market, this newly opened distillery is all locapour. Its slick copper pot stills beam behind the industrial glass frames that separate the operation from the bar. In this refitted industrial space, British Columbian grains are mashed, fermented and (at least) triple-distilled in small batches to concoct Liberty’s aromatic and bright gin, white whisky and vodka. When you go: Visit on a weekend (Saturdays and Sundays at 1 p.m. and 3 p.m.) for a $10 tour with samples, or drop by the bar during regular hours to taste and compare flutes at the same price. Yes, there is more than one local sake producer in North America, and one of them happens to be in Vancouver (to date, New York has none, although rice production is possible). Owner Masa Shiroki started by importing high-end sakes from Japan but now produces his own on Granville Island with both Japanese rice imports and organic sakamai rice that he grows on nearby marginal farmland. The difference is unmistakable. When you go: Sample three sake styles for five bucks at their factory, which sits adjacent to Liberty Distillery in the Railspur District. For a swanky — yet still nerdy — bar lounge experience, try the Keefer. Their menu is an actual book brimming with calculated cocktails inspired by ingredients sourced from the surrounding Chinatown neighborhood. The menu changes regularly, but guests can expect housemade ingredients like black pepper bitters, Oolong tea syrup and seahorse (yes, the marine fish) tinctures. Chances are you’ll come across something new, so go curious or go home. Bao Bei could be Andrew Tarlow’s first venture outside of Brooklyn. Sitting right up the hill from the Keefer, this Chinese brasserie also takes influence from the neighborhood with fusion dishes like the pork jowl with Pixian chili bean, plum glaze, pomelo, grapefruit, mint, cherry tomatoes, peanut, fried shallots and nước chấm dressing. They keep a robust B.C. wine selection alongside Asian inspired cocktails. When you go: Try the chino margherita: tamarind-infused tequila with ginger, lime and egg white with a chili salt/sugar rim. The name of this restaurant tells a lot but not all. The predictably farm-to-table establishment has a refreshingly imaginative menu with highlights including five-spice braised beef carpaccio with pickled cucumber, shallots and cilantro alongside the gem oysters with celeriac, an oyster emulsion and horseradish “snow.” Serving size tends to be small, so unless you’re ordering the Angus rib eye, consider ordering two plates. And for SCOBY enthusiasts, you can order kombucha either straight up or in cocktail form with gin, aperol, grapefruit and Angostura bitters. The neighborhood radiating out from East Pender Street has been home to Vancouver’s Chinatown since the turn of the 20th century. Compact and diverse, the community seems both cosmopolitan and insular (if only enough to maintain its distinctiveness). Dim sum might be trending, but at Jade Dynasty, it’s tradition. Ingredients — including translucent rice noodles and taut shrimp dumplings — are prepared “in the old way,” as the management says. When you go: A little can go a long way with dim sum, but however much you order, end with the jin deui: a spherical fried rice flour pastry rolled in sesame seeds and plumped with an ink-like black bean paste. Cross the Cambie Street from Jade Dynasty and you’re at New Town: a traditional Chinese bakery with goods that are so coveted that Seattleites have been known to regularly drive the two and a half hours north across the border solely for the establishment’s apple tarts. Fact or fiction, the tarts are undoubtedly swoon worthy; served piping hot, the filling is more savory than it is sweet. When you go: Order the apple tart with a cup of coffee, and consider the egg tart or mooncake if interested in dabbling. My favorite hole-in-the wall sushi spot. In Kitsilano but off the beaten track: funky decorations, a great collection of manga comics. Authentic sushi with a few nods to Vancouver’s obsession with all things healthy: organic and brown rice options, plus decorative twists (banana leaves and fresh fruit) that keep me coming back for more. You can see the farms for yourself and find their produce at these farmers markets and restaurants. Vancouver Farmers Markets have slowly grown to be one of the keystone food activities of our city, happening at least every week year round (at some locations). It has been a benchmark for the promotion and celebration of all things local. They do millions of dollars in sales every year!